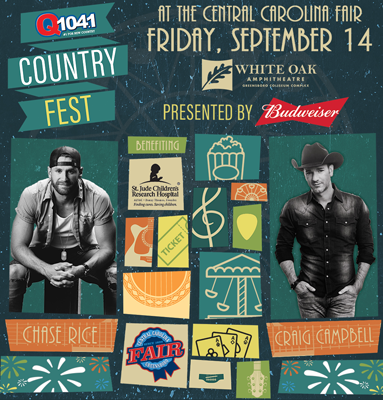 As part of the 2018 Central Carolina Fair Concert Series, Q104.1 presents ‘Country Fest’ featuring Chase Rice in concert at White Oak Amphitheatre on Friday, September 14. Gates open at 6 p.m.
A limited number of reserved tickets will go on sale Friday, August 10 at 11 a.m. at www.ticketmaster.com and the Greensboro Coliseum box office. Reserved tickets are $25 and include admission to the Central Carolina Fair. With easy charisma and smooth, expressive vocal chops, singer-songwriter Craig Campbell has earned comparisons to neo-traditional icons like Alan Jackson and Randy Travis. Campbell’s hits include “See You Try” and “Outskirts of Heaven” and his singles “Family Man” and “Outta My Head” both cracked the Top 15 on Billboard’s Country Airplay chart.